Felt wheel washer for Beam Rugmaster Plus 045389, Rugmaster with switch 045320, and Butler power head 045330. This is the genuine Beam Rugmaster Cord New Style 2 Prong for your Beam Rugmaster power nozzle. Cord installs into the Beam power head then connects to the extension wand. Genuine Beam 5.7" rubber motor gasket. 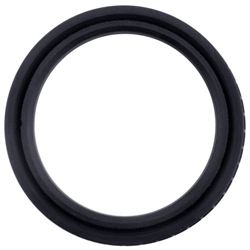 This will fit many Beam, Electrolux, Frigidaire, and Honeywell central vacuum models. Click for a list of compatible models that this will work with. Available from Central Vacuum Direct. Available from Central Vacuum Direct. Headlight for Rugmaster Plus 045389 power nozzle and many more. Genuine Beam anti vibration upgrade kit for power units. Designed to be used with the mounting bracket to reduce the vibration of your central vacuum main unit. Will fit all Beam, Electrolux, Frigidaire, and Honeywell central vacuums. Available from Central Vacuum Direct. Genuine Beam wiring harness assembly. Will fit many popular Beam, Electrolux, Eureka, Frigidaire and PowerStar Central Vacuum units. Click for a detailed list of model numbers that this is found in. Available from Central Vacuum Direct. Replacement Beam Rugmaster Wheel. Service note: When using this wheel for a Beam Advocate power nozzle you will have to remove 1/4" from the post that holds the wheel in place on the nozzle base to get it to lock in place; the original wheels have been discontinued. Why replace the whole power head when you can just replace the broken part? Available from Central Vacuum Direct. Genuine Beam Atlis intake seal and bag upgrade kit. This kit will tighten the intake seal on your power unit and allow you to use a disposable bag making it less messy when you empty the dust bucket. Click to find out which models this is compatible with. Available from Central Vacuum Direct. Available from Central Vacuum Direct. 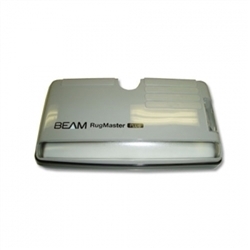 Replacement Beam Rugmaster Brush Cover for the Beam Rugmaster central vacuum power head at Central Vacuum Direct. This cover for the Beam Rugmaster is located within the power head itself. It covers the brush roll and is easily installed. Don't let your worn down brush strips cause a problem with your power head. These genuine Beam Rugmaster Replacement Brush Strips will fit all Beam Rugmaster or Eureka CV205 models. They are easily installed and will bring new life to your central vacuum system! Get yours now at Central Vacuum Direct! This high quality, steel Beam Rugmaster Brush Roll is designed to be used with the Beam Rugmaster and Eureka power heads. The replaceable brushes make it easy and cost effective to keep cleaning your home efficiently! Fits all Beam Rugmaster Models, Eureka CV205, and Honeywell model 045320 Replacement Beam Rugmaster base housing for the Beam Rugmaster central vacuum power head at Central Vacuum Direct. Base Housing for Rugmaster Brush with switch and white cover 045320. Before Jan. 2000 after 2000 use 155472 with a gray cover.